And so, one by one the goodbyes commence. Doors are closing and I’m currently in this limbo where none are yet opening. Goodbye to school, to Petach Tikva, to Masa Israel Teaching Fellows, to Israel Experience, to my volunteer project with the Petach Tikva Department of Environment Education, and to my friends and family in this special country. The first farewell was at Yeshurun for the end of the school year. The week before our last day, one of the 7th grade classes we work with threw us a surprise party! 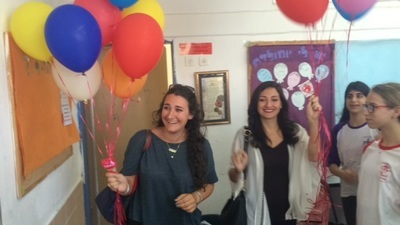 We walked into the classroom unsuspectingly, only to be bombarded with 30 students and balloons, singing, food, and an Israeli style מסיבה (meh-see-ba: party). We all shared our summer plans and what we loved about working together. Hopefully, some of our students will stay in touch. We took our balloons with us out of school and released them together in our own little goodbye ceremony. 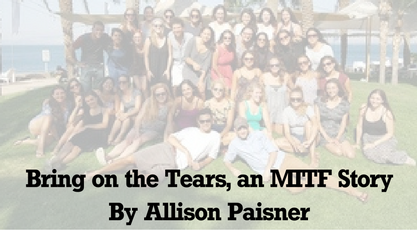 As for the rest of the classes, we didn’t really have an official goodbye, but Emily and I made a video for the Petach Tikva MITF closing ceremony with some of our favorite 8th and 9th graders, which you can check out HERE. The purpose? To debut the video as a thank you from our school to the rest of the Petach Tikva MITF. It was my first time experimenting with iMovie… let’s just say I won’t be the next Spielberg. The next goodbye was to my actual role as a teacher. Israel Experience had us plan a closing ceremony, in which we thanked our host teachers, host families, and the people who helped make our transitions this year into the Israel and teaching worlds easier. My host teacher, Shlomit (another teacher we work with who is amazing), and the librarian Batia (whom we got very close to throughout the year) all showed up. We closed out the year together with the rest of the English team (or the “E-Team” as we call ourselves) at Chagit’s house with a little get-together. Potluck style, we shared our thank you’s as well as received many (in addition to beautiful silver Shabbat candle holders) and had a last shebang recapping the year and sharing our future/summer plans. Will miss my Yeshurun community dearly, and only leave with fond (and funny) memories! 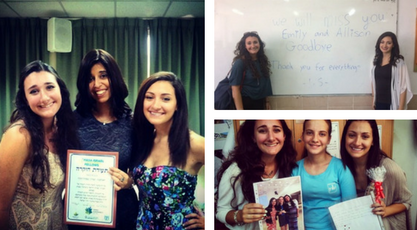 Another goodbye that went out with a bang was with the Petach Tikva Department of Environmental Education. As you’d know if you’ve been reading my blog throughout the year, this center has become one of my homes in Petach Tikva. From volunteering at the garden on Tuesdays and getting a glimpse of the composting program at the gans (kindergartens) in Petach Tikva, to working on a lecture on Adaptive and Resilient Cities with the office staff, it was nothing but a pleasure (in the end). Frustrating for me at times, because of the Israeli work style and process, is topsy-turvy from the States, I learned patience, sympathy in the workplace, and the importance of synergy among a group of people from all different backgrounds and ages. As part of the culmination of my volunteer service, the director of the office and I set a date for me to present my lecture on Adaptive and Resilient Cities to members of neighboring municipalities… in English, of course. For nearly 2 hours I presented on concepts of vulnerability, mitigation, adaptation, resiliency, and sustainability, drawing case studies from around the world for best practices and policy implementation strategies. The entire audience was interactive, welcoming, and receptive to the material so it was overall an amazing experience for me to be able to present my research in a more formal setting to people. The following week I said my final goodbye to the office, where they presented me with a memory jar (sustainably made, obviously) and warm wishes for my future. I know we will continue to stay in touch, and I am genuinely interested to continue seeing the innovative educational initiatives the department comes up with. And then came the goodbye to MITF at HaYarkon Park in TLV. All of the Israel Teaching Fellows from around the country came to hear the CEO of Masa Israel and our Pedagogical Advisor from the Ministry of Education, among others, thank us for our work and spend a relaxing night celebrating the end of our experience. With free booze, a diploma and dope portable speakers as a little parting gift, it was a beautiful night and atmosphere, with lots of goodbyes to my friends from other cities. The last MITF goodbye was just with Petach Tikva and Rishon, thanks to Israel Experience and our closing tiyul. 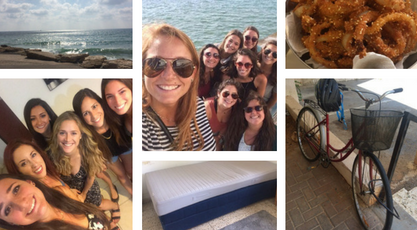 This is the group we started off with August 27th when we met in Kiryat Moriah for the first time, and it’s the same group we are ending with on June 27th. Thankfully (and amazingly), we had some money left over in our budget, so Israel Experience spared no expense on this one! We rafted down the Jordan River (which had more than 6 inches of water in it this time! 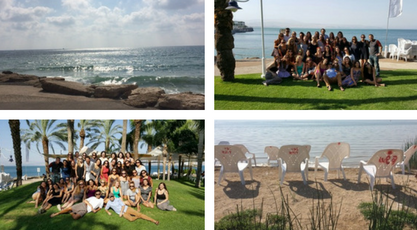 ), enjoyed a BBQ buffet by the water (wow, how I miss BBQ), spent one day at a beautiful “resort” on the Kinneret, and ended the trip back at Zichron Ya’akov where we had our first seminar back in September. The meals were lavish, and I ate enough kosher meat to last me until my next trip to Israel… or so I say for now. In addition to the physically packed schedule was the equally emotionally packed one as well. In a series of reflection activities, our group shared the ups and downs, favorite and worst moments, and highlights and regrets of the year. The 14 fellows in Petach Tikvah also had our own reflections, where we filled out private notes for each other in little memory boxes, crafted by our Madricha, Amit. I even debuted my ukulele playing skills (or lack thereof) when one of the Petach Tikvah Fellows performed a song he wrote for the group. The whole tiyul was surreal because of a lot of the people in the cohort I really didn’t get to know so well even after a year. It was a strange feeling for the final doors of MITF to be closing, and the tears and sobs began. Two weeks later, and I’m magically hydrated enough to cry nearly every day. But the journey isn’t over yet. I’m still here until July 18th, and after all of these goodbyes to MITF, I still had all of my closest friends and family. For our last Friday Shabbat dinner altogether, we had a giant potluck at one of my friends’ boyfriend’s apartment in Tel Aviv. Roi and I contributed with Mac and Cheese (which apparently Israelis aren’t too familiar with), homemade onion rings, and my favorite Israeli salad with nishnooshim (it’s good, trust me). Emily and I brought the skits we wrote for our English day, and after a few drinks, we had our boyfriends and friends act them out! Hands down one of the funniest things I was lucky enough to witness. Another favorite game is a three-round combination of taboo, one-word giveaway, and charades with the same series of words/phrases. Major כל הכבוד to the Israelis in the house whose first language (and for some, even second language) isn’t English. Truly a night filled with laughter and love that I will never forget.